When it comes to the culture and history of Taiwan, we recommend you hop on a high-speed train and head down south to the cities of Tainan and Kaohsiung. Tainan is an old city filled with ancient monuments, fascinating temples and countless delicious street foods to try, whereas Kaohsiung is known as the second city of Taiwan and one of the largest container ports in the world. There are not as many hostels in the south as there are in Taipei or elsewhere, but luckily, we came up with a short list for you. Here are a number of home-style hostels that we know you will certainly love! The story of Fuqi Hostel began with two Taiwanese and a French guy, Kevin, Amily and Thierry. After meeting on a same flight back to Taiwan, Amily and Thierry realized how passionate they both are about Tainan, and were inspired to start a backpacker’s hostel: a comfortable and chilled place where travelers could come to make friends and explore the charming old city together. If you break down the first character of the hostel’s Chinese name “合”, you will get “人一口” which literally means “one bite per person”. 365 Hostel believes that when travelers and locals discover and share food together, it will always end up as one of the most memorable moments of the journey. So, for foodies, this hostel is THE ONE. As an adaptation of a typical Taiwanese old house, it is situated in the historical area of West Central Tainan, in Lane 365 on the Ximen roundabout, where endless food places are within short walking distance, including the famous Guohua food street. Danzai noodles, squid potage soup, rice pudding wagui, … Loosen your belt and eat away! Knock Knock Hostel can’t be prouder of being part of the sunny southern city that is Kaohsiung. Rich, vibrant and yet stress-free, the city is a modern urban landscape filled with airy cafes, wide streets, bicycle lanes and endless cultural sites, it will take days to see everything, which is why this hostel will be necessary for the trip. Travelers from everywhere around the world are more than welcome to come knock on Knock Knock Hostel’s door; hopefully what’s behind it will keep you from leaving. It provides you with the most comfortable beds that will make you feel like home, and a modern-meets-vintage lounge area to unwind yourself and make friends. Don’t keep them waiting, just knock! Taipei is always the first stop for travelers visiting Taiwan, and choosing the right hostel to start off the journey is very important. It has to not only be super comfy and affordable, but also perfectly and conveniently located! Here are a few hostels in Taipei that tick all the boxes. Each and every one has its own unique vibe, go on and pick your favorite! P.S Stay updated for the next two upcoming posts, we have more recommended hostels for those who are planning to travel to the south of Taiwan! Located in the heart of the city center, Formosa 101 Hostel is the ultimate address for every traveler who comes to explore Taipei. It is a modern, clean, young-in-spirit, beautiful hostel. Not only does it have everything a traveler would need, it is surrounded by everything you would want to explore, taste, and enjoy in this unique city - and all for an affordable price. The best part about Formosa 101 though, is the variety of activities that it offers, including weekly free walking tours to Jiufen and Elephant Mountain, and a few once-in-awhile special events such as mini music concerts, calligraphy and henna teaching classes. If you’re lucky to be there around New Year, you get to join their once-a-year rooftop BBQ party, with a VIP view to the Taipei 101 fireworks! Centrally located in the hip student district of Shida, Eight Elephants & Dreaming Dragon is a homestay-style hostel, a home away from home. Unlike most others, it is located in a local residential area away from the busy commercial streets, which is what most travelers love about it: you get to easily explore the local neighborhood during daytime, and enjoy a calm and relaxing evening. Whether you are just passing through on your backpacking journey, or planning to stay a while for study or work, EE&DD is a cozy, friendly place for all sorts of travelers. There are two different living spaces in the hostel, allowing guests to not only work hard but also play hard. Come and share your story, they are more than happy to be your first friend in Taipei! Fun Inn Taipei is probably one of the most convenient hostels you can find in Taipei. Located in the heart of the city, the transportation nearby can’t be more convenient: 5-10 mins away from Ximen MRT, Taipei Main Station and Taoyuan Airport MRT by walk! Trains, buses, high-speed railway… they are all reachable. Fun Inn Taipei is not only a convenient hostel to spend the night at, it is also the perfect place for you to create wonderful memories. In the lounge, you will find cozy sofas, a kitchen and dining area, a big-screen TV and board games, everything you need to interact and have fun with other travelers! Famous home of hot springs in the Taipei area, Beitou District is the place to be for tired travelers to enjoy authentic thermal hot springs. If you like the idea of having a hot spring nearby, then stay at On My Way Taipei Hostel! The hostel is conveniently located near Beitou MRT station and just one stop away from Xinbeitou, where the popular hot springs area is; you can either pick a hot springs hotel and get a private room for yourself, or blend in like a local and go to the public baths (which are way cheaper than the hotel ones). Founded by a group of backpackers in love with traveling, On My Way Hostel has three other branches, one in Jiufen, and two in the south (in Taitung and Hualien). It seems like the hostel is everywhere around the island, and that should explain just how great they are at managing hostels. Jiufen has always been one of the must-visit places while visiting Taipei, and On My Way Jiufen Hostel is the very first backpacker hostel in the area. It was rebuilt from an old historical house, keeping much of the artwork and interior decoration of the previous owner. It is well located, only a 3-minute walk to the 7-Eleven on the Old Street, and very close to all the local shops and restaurants. When the weather is good enough, the hostel occasionally offers late-night walking tours for travelers to see a different side of the mountain town. Being the second largest cosmopolitan area in Japan after Tokyo, over 9.4 million foreign tourists visited Osaka in 2016. As it can get quite confusing for travelers when booking a flight to the city, let’s quickly go through it’s two airports: Kansai International Airport (KIX) and Itami International Airport (ITM). Located 50km south of Osaka, the Kansai International Airport opened in 1994 and took over all international flights from Itami Airport, as well as some of the domestic flights. The airport has two terminals, with Terminal 2 being exclusively for low-cost carriers. However, it has fewer bus connections and no train station, but is connected to T1 with free shuttle buses. As for the transportation to Osaka, you can either take the airport limousine bus or the train, which is the relatively cheaper and quicker option. There are three different trains: Nankai Railways that goes to Namba and Shinsaibashi (area for shopping and nightlife), JR Haruka train that goes through Osaka, Kyoto… etc, and JR airport rapid train that also connects the airport to Osaka. Located about 10km north of Osaka, Itami International Airport is no longer the international airport of Japan, but the name was left unchanged after being taken over by Kansai International Airport. It is classified as a first-class airport and is now entirely domestic, with 30+ destinations across Japan. To reach Osaka from Itami Airport is quite simple: you can either take the airport limousine bus, or the Osaka Monorail for a slightly cheaper option. With the monorail, transfer at the next station Hotarugaike to the Hankyu Takarazuka Line for Umeda Station. To summarize, you will be flying into Kansai Airport if you’re arriving from another country, and probably into Itami Airport if you’re just flying from another Japanese city! Taipei, the capital of Taiwan is a city full of beautiful temples, contemporary buildings and buzzing night markets. It's modern and vibrant and full of the unexpected and what's even better, its possible to see this amazing city for free. Join in on one of its free guided walking tours and experience the streets as the locals do. Simply book a spot online, meetup and join in on the fun. No need to worry about how you’ll see the city or even about how much it will cost. The tours are free, they’re professional and they’re guided by locals. What's better than that! TourMeAway provide entertaining and informative free walking tours in Taipei City every day, by young local tour guides. They have some great reviews on their Facebook page and on TripAdvisor. This free walking tour will walk you through the old town of Taipei. For the old town Taipei tour Book here. This interesting and free tour is a journey back into Taipei’s past, to the eighteenth-century Wanhua district where Taipei City was founded.The Longshan Temple Tour is a great way to learn about Taipei’s most historic temple and your guide will also take you to a night market to try out some late night snacks. For the Longshan Temple tour Book here. According to Like It Formosas website, they are a group of people who love Taiwan. They also have some good reviews on their Facebook page. The west end of Taipei was once the center of political and economic activity and it is where modern development started. This tour takes you through Taiwanese history, starting from the traditional beliefs of the late Qing dynasty, to the cultural shifts under Japanese ruling, and then to the political landscape after the arrival of the National government in 1949. Walking from the past to the present, you will see how Taipei is shaped by multiple cultures and historical events. To book the historic tour Book here. Modern-day Taipei is a city full of energy, and this tour highlights the top trending places and local secret spots in the bustling city center. The Modern Taipei tour covers the latest innovations in the city and the coolest and most popular spots to explore day and night. To book the modern tour Book here. The roaring twenties was a colorful period, a Golden Age for commerce and culture. As Pablo Picasso is to Spain, Ernest Hemingway is to the U.S, so is everything that prospered around Taipei North Gate and Dadaocheng, to Taiwan. The Taipei Free Golden Age Walking Tour walks you through places where Taiwan's writers and artists once gathered. Experience the oriental version of the roaring twenties in Taipei! For the Golden Age tour Book here. Visit the cities favorite hiking spots, stroll along the small lanes downtown surrounded by trees and gardens and climb up a hill to a beautiful Taoist temple to see the panoramic views of Taipei and Taipei 101. You will be collected by private bus* which will drive you back to your selected pick up point before 12:00 PM. *Free private bus. 8:10 AM No.140, Chang'an W. Rd. In the States, you eat bacon, scrambled eggs, buttered toast and coffee in the morning; but what about here in Taiwan? Sure, we have plenty of western-style breakfast shops, but what does a proper traditional breakfast look like? This is probably the most popular set that locals eat for breakfast, in Chinese we call it shaobingyoutiao, which refers to the clay oven roll and fried bread stick together. The fried bread stick literally means “oil stick” in Chinese, it’s kind of like a churro but salty. Some people like to have it with an omelette instead, called shaobingjiadan. The traditional way is to order a bowl of warm soy milk and dip it in before eating, don’t forget to try! Another very typical Taiwanese breakfast would be rice porridge with side dishes of all sorts, ranging from pork floss and pickled cucumber, to salted duck eggs and peanut glutens. In the south of Taiwan, in Tainan City, locals eat a more specific kind: milkfish porridge, which is actually less of a porridge and more like a slightly sweet fish soup with rice. This can also be for any other meal of the day, and is especially popular as a midnight “snack”! Also known as Taiwanese omelet, danbing is a soft scallion pancake with an egg fried on top and then rolled and chopped up. You can eat it like that, or add fillings of your choice: cheese, bacon, corn, pork floss… even hash brown is an option! P.S Try it with some soya sauce or chili sauce for a bit more flavor. Where to try: literally any breakfast shop in Taiwan, it’s impossible to not find it. Fan tuan is super easy to eat when you’re in a hurry and need to get through breakfast while heading somewhere. It’s basically a big oblong ball of hot sticky rice filled with a number of tasty little things like small pieces of fried bread stick, pickled veggies, pork floss and spiced omelet. It is usually washed down with soy milk or rice milk! Luobuogao is a mixture of shredded turnip and rice flour (and sometimes with dried shrimp), and can be cooked either steamed or pan-fried. It is very popular to eat it with a half-done fried egg on top or with some sweet chili sauce. Where to try: also in any breakfast shop in Taiwan! CallCar: Airport Share Rides in Taiwan. If you are looking for a safe, convenient and affordable ride to or from any of the airports in Taiwan, a shared ride is definitely worth the consideration. CallCar, who have been operating for ten years in Taiwan, offer airport shuttle services from as little as NT200, making it one of the most affordable ways to travel in Taiwan when you fly. Simply schedule a trip on the app, and CallCar will link you up with others to share the ride. The Basic price is NT$199- NT$389 per person but the price will be calculated based on the number of occupants traveling in the vehicle. The more people who share the less you pay, it's that simple. All cars have GPS which means full security and protection, and their drivers are friendly, professional and have no prior accident records. At the moment the areas of service are Taipei City, New Taipei City, and Taoyuan City; however, for remote areas, please refer to their website and input your address. Call Car operates at all four major airports; Taoyuan International Airport, Taipei Sung Shan Airport, Taichung Chingchuankang Airport, and Kaohsiung Airport. Internet reservations are open 24 hours but you will need to register yourself on their website beforehand and input your credit card details. There is no cash accepted. Once you have registered you can request a ride, through the APP or from the website. You can also download the APP to make and to manage your bookings. Unfortunately, only Taiwanese mobile numbers are accepted. Once you have made a booking, and 20 hours before your schedule, you will be able to see your pickup and dropoff information, including the driver and the vehicles number plate. Pay by credit card through the APP, no cash accepted. You will be allowed one piece of hand luggage and one piece of large luggage (20- to 29-inch). If you have additional pieces, you need to reserve extra space at NT100 per piece. If you do not reserve excess baggage in advance, you will only be permitted the basic luggage allowance. Between 10:00 PM ~ 5:59 AM (22:00 ~ 05:59) , you will be charged an additional NT$200. When talking about Taiwan, most people only think of the sweet potato-shaped island, but it’s more than just that. In fact, Taiwan has many outlying islands that are still little-known, where you get to enjoy a whole beach to yourself and bike for an hour or two without any cars blocking your way. Here is a quick intro to the main outlying islands around Taiwan. Located on the west side of Taiwan, Penghu archipelago actually consists of 60 to 100 small islands (depending on how you see it), out of which only 20 are inhabited. Magong is the main town where tourists come and go, but it is important to get off the main roads and wander into the less popular areas to really see the island. For instance, on the east side of the main island of Penghu, you’ll find a beautiful green countryside where you can walk and admire old choral stone houses more than 400 years old! Green Island is one of the most popular islands around Taiwan, brimming with tourists throughout the summer. Although the beaches aren’t especially remarkable, it is the perfect place for underwater activities like snorkeling and freediving. Above water, there are also a few cross-island trails with nice scenery and great wildlife-watching occasions (try to look for the sika deer, Green Island’s most popular animal residents). Lying just off the southeast coast of Taiwan, Orchid Island is a volcanic island surrounded by countless unpolluted coral reefs and is home to green sea turtles, making itself the best destination for nature-lovers. Inhabited by the Tao aboriginal tribe, Orchid Island’s cultural features are also another main reason for you to visit: depending mostly on the sea for their livelihood, the aboriginals wear narrow loincloths when fishing or hunting; they go out in beautifully-painted canoes and perform huge ceremonies to start off the annual flying fish season. Definitely worth a visit! Off the southwestern coast of Taiwan, the island is the only outlying island composed of coral and also the smallest one of them all. You can easily bike around the island while checking out the fascinating rock formations along the coast. If you’re visiting Taiwan around April, one special event not to miss on the island is the largest Taiwanese festival to honor Mazu, the Goddess of the Sea. Near Fujian Province of China are two other islands: Kinmen and Matsu. Kinmen is quite different from the other outlying islands, it isn’t known for its scenic views but is without doubt the best destination for those who are into culture and architecture. Once one of the most fortified places on earth, the island is home to an impressive concentration of historic structures: ancient military sites that were once important, memorial arches from the Ming dynasty, “wind-lion god” statues that for centuries have watched over Kinmen’s villages, and countless more. Matzu is also historically and culturally distinct from mainland Taiwan. As the inhabitants’ ancestors were originally immigrants from northern Fujian, most of the islanders kept their fishing heritage and speak the Minbei dialect. Out of all the other outlying islands, Matzu has the most to offer: historically, it also has the best hikes and ocean views, as well as beautiful Fujian-style villages with old stone houses. Được xây dựng gần ba thế kỷ trước ở khu vực cổ của Đài Bắc (huyện Wanhua), Long Sơn Tự là một trong những ngôi chùa nổi tiếng nhất ở Đài Loan và là điểm đến hấp dẫn đối với các tín đồ văn hóa phương Đông. Long Sơn Tự có rất nhiều vị thần để mọi người có thể cầu nguyện, tùy thuộc vào nhu cầu của họ. Ví dụ, thần trí tuệ, thần kinh doanh, nữ thần sinh con ... thậm chí có một vị thần chuyên mai mối! Những con người sùng đạo trên khắp hòn đảo Đài Loan này thường đến để dâng trái cây và các món ngon cho các vị thần của họ. Nhưng không giống như tôn giáo phương Tây, họ không sử dụng thánh giá để cầu nguyện; thay vào đó, họ sử dụng hai khối gỗ hình lưỡi liềm. Về cơ bản giống như một chiếc điện thoại để kết nối với các vị thần! Nghi lễ này được biết đến với tên gọi là bwa-bwe, nơi mà những người có thắc mắc muốn xin ý kiến thần linh sẽ ném hai mảnh gỗ lên mặt đất trước bức tượng của các vị thần; hình dáng miếng gỗ rơi xuống là câu trả lời. Nếu một mảnh ngửa và cái kia thì úp xuống, đó nghĩa là ĐỒNG Ý. Nếu cả hai mảnh úp xuống thì đó là KHÔNG, và nếu cả hai đều ngửa có nghĩa là KHÔNG RÕ RÀNG. Bạn thấy đơn giản mà phải không? Nếu bạn có một câu hỏi đã làm phiền bạn, hãy đến đây để nhờ những vị thần này giúp đỡ! Trước khi bước vào, bạn phải cầu nguyện với vị thần "chủ nhà" của chùa, để được phép hỏi các câu hỏi: nêu tên, ngày sinh và địa chỉ của bạn cho chủ nhà biết, trong đền thờ này là nữ thần từ bi và lòng thương xót, Guanyin. Khi đã bước vào trong, bạn có thể cầu nguyện với các vị thần còn lại, bắt đầu từ bên phải. Sau đó, bạn có thể đi đến vị thần mà bạn muốn nói chuyện. Hãy hỏi "Thần có ở đó không? ", Bởi vì ông ấy/bà ấy có thể bận. Bạn cần sự đồng ý để được hỏi tiếp; nếu thần trả lời bận, chờ vài phút và hỏi lại. Hãy đặt hỏi câu hỏi ĐỒNG Ý / KHÔNG ĐỒNG Ý một cách rõ ràng. Nếu câu hỏi của bạn liên quan đến một người nào đó, hãy cho biết chi tiết về người đó. Bây giờ, nếu bạn muốn có một câu trả lời sâu hơn, bạn cũng có thể xóc ống đũa để một thanh đũa ra khỏi ống gần bàn thờ. Mỗi thanh có một số trên đó, tương ứng với một câu nói cổ của Trung Quốc. Đặt câu hỏi của bạn, và hỏi xem các vị thần có sẵn sàng cho bạn một thanh không; bạn cần ba câu trả lời ĐỒNG Ý liên tiếp để kéo ra một thanh. Khi bạn đã có một thanh, hãy hỏi nếu nó là một trong những điều các vị thần muốn bạn có; cùng với ba quy tắc ba sự ĐỒNG Ý.
Nếu vị thần cho bạn ba thanh ĐỒNG Ý, bạn có thể lấy một tờ giấy với câu nói của người Trung Quốc cổ và đi đến một sư chùa của đền thờ để được giải thích thêm. Không giống các đồng tiền khác như đồng Đôla và đồng Euro, tiền tệ của Đài Loan là điều mà hầu hết mọi người chưa bao giờ nghe đến, cho đến khi họ quyết định lên kế hoạch cho một chuyến đi đến hòn đảo xinh đẹp này. Vì vậy, bài viết này sẽ giới thiệu nhanh và cho bạn một vài lời khuyên hữu ích. Làm thế nào để thanh toán tại Đài Loan? Tất nhiên, thẻ tín dụng vẫn được chấp nhận rộng rãi (Visa, MasterCard ...), đặc biệt là trong các trung tâm mua sắm và hầu hết các nhà hàng. Easy Card. Cực kỳ thuận tiện cho việc đi tàu điện ngầm, xe buýt, và thậm chí để thanh toán tại những nơi như cửa hàng tiện lợi, hiệu sách, rạp chiếu phim, và cả Starbucks! Bạn có thể dễ dàng có được một thẻ Easy tại 7-11 hoặc bất kỳ ga tàu điện ngầm. Làm thế nào để rút tiền mặt? Không có nơi đổi tiền mặt trên đường phố, nhưng có rất nhiều cách khác dễ dàng để có được tiền mặt. Tại sân bay, luôn có một vài quầy đổi tiền và ngân hàng. Cây ATM có ở khắp mọi nơi (có cả Tiếng anh và Trung)! Từ đường phố, trong các trung tâm mua sắm, ở phía trước của các ngân hàng và ngay cả trong các cửa hàng tiện lợi như 7-11. Tuy nhiên, sẽ có thêm phí rút tiền, vì vậy tốt nhất là bạn nên chuẩn bị đủ tiền mặt cho toàn bộ chuyến đi trong 1 lần. Tại các ngân hàng, họ thường mở cửa từ 9 giờ sáng đến 3 giờ 30 chiều và đóng cửa vào cuối tuần, vì vậy hãy nhớ đến sớm nhé! Bạn sẽ được yêu cầu điền vào biểu mẫu bao gốm địa chỉ và số điện thoại địa phương hợp lệ, chỉ cần ghi tất cả thông tin về khách sạn mà bạn đang lưu trú là ok.
*** Hãy nhớ! Luôn luôn mang hộ chiếu của bạn khi bạn muốn đổi tiền mặt tại một trong những nơi này (trừ máy ATM). Oh và một điều khác nữa là: hãy đổi phần tiền mặt còn dư của bạn trước khi rời khỏi Đài Loan, bởi vì NTD không phải là một đồng tiền dễ dàng để trao đổi, đặc biệt là khi ra khỏi châu Á! Using an UBER in Los Angeles. Whether you are a frequent wanderluster or a newbie-traveler, Los Angeles is exciting, sunny and hip. A bustling metropolis with mountains, rivers, sun-kissed beaches, and one of the biggest airports in the world, Los Angeles International (LAX). In 2016 LAX handled 80,921,527 passengers, so it is one of the busiest airports in the world too, this means the last thing you'll want to face on arrival after the queue at customs and your baggage collection; is the taxi lines, bus schedules or hotel shuttle services. But, don't despair, LAX has UBER! In LA there are thousands of UBER drivers much cheaper than regular cabs. If you've never used UBER before, the drivers are everyday people driving their personal cars (which have to be in good condition and registered with UBER). Passengers will use an app on their smartphone to request a ride and the driver has the same app so they can find the passengers easily. What is great is that you can tell the exact cost of the journey before the cab arrives through the APP, so no surprises, and UBER will make the payment on your behalf once you exit the cab (via the credit card you have saved to your profile). Just thank the driver, jump out, and then rate them afterwards. It is safe, reliable and very convenient. What's more, the UBER APP is global so you can use the same profile and credit card you use back home. How to use UBER at LAX. To use UBER, register online and download the APP prior to arriving in LA. On arrival, LAX has free Wifi if you need a connection, and then simply log onto the APP from your smartphone. You can request a cab by inputting where to meet them, double check the sign closest to you once you exit for this. The APP will ask you to specify your terminal and door number to help you clarify your pickup location. If you are worried, however, you can call your driver. You can also see the name and license plate number of your driver in the APP. As well as see them (literally) on the APP as they drive to collect you, and they can see you too. 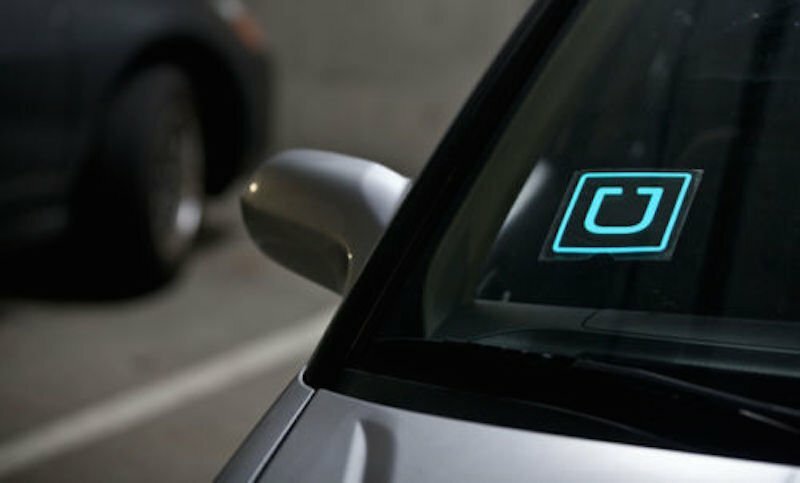 Look out for the Uber decal/trade dress which will always be displayed on the passenger-side windshield of your driver’s car. Just remember to exit at the right level, selecting your terminal and nearest door number, and meet your driver curbside. Remember that LAX is a very busy airport and UBER drops off and collects passengers almost 24 hours a day here, so chances are, there will probably be an UBER cab already waiting before you request. It is therefore important to only request a cab when you’re already outside, as cabs cannot wait around . Where to meet your UBER. Meet drivers on the departures (upper) level. Meet driver downstairs on the arrivals (lower) level. Picked up is in the designated access zone on the arrivals level. Select a car that suits your requirements and group size (luggage too). If you have multiple bags or passengers, a larger vehicle would be a better option. A high-capacity vehicle like UberXL is an option that seats up to 6 riders. Uber offers a range of services, from single riders, groups as well as executive limo services. uberPOOL: Shares your ride and the cost. Good for 1 or 2 riders with a small amount of luggage. If no one is going where you are going and you have selected uberPOOL, the driver will wait up to five minutes and then depart with you alone and you’ll still get half-off (Uber will pay the driver the other half). UberX: Is the cheapest and most common form of Uber. It is good for 1 or 2 riders with a small amount of luggage. UberXL: For a group with multiple bags. SUV or minivan. UberASSIST: Request an uberX or uberXL driver who is trained to assist passengers who require assistance. UberSELECT: A step above the everyday; request a ride in luxury sedan with a leather interior. UberBLACK: Request a high-end luxury sedan driven by a professional driver. UberSUV: UberBLACK for a larger group, it can seat up to 6 passengers. UberWAV: Passengers with accessibility needs may request a wheelchair accessible vehicle with UberWAV. FARESOnce you're in the cab, the driver will take you to your destination and then Uber charges your credit card directly through the app including tip. Go here for current rates in Los Angeles or try the UBER fare estimator here. Keep in mind that the fares are for one car, not per person. If traveling with a group, the cost per person is even lower. You can choose to split the bill between the group as long as the other travelers have UBER.